What is the difference between evolve hero lvl187 or lvl200? 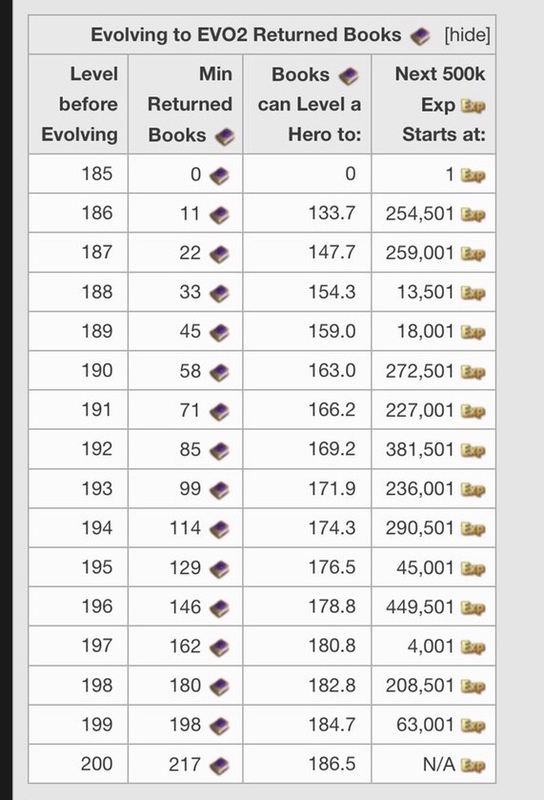 At level 187 you will get a few purple books back that can be sold for HB/Aetherock or used to level your newly evolved or other heroes back up, and at level 200 you will get many more of those same book. In short if you have resources to level your hero back up to a respectable level, and don't have other heroes you need the books/hb for then there is no valid reason not to evolve @ 187. However if you are short on resources, have heroes in holding that also are waiting for resources, or can use the books for leveling equipment on your heroes, hold out as long as possible. I don't know how accurate this chart is but, it should give you some idea of the variance in books returned based on when you evolve. Keep in mind, if you don't actually need the books, there is no reason to wait. You don't get more exp in return, with the exception of 1 book, assuming you are at least 1 exp over the next threshold. I would also add that if you have Enlighten as your talent, take the hero to 200. Use your HBM & dungeon sweeps to maximize the benefit from Enlighten and get those purple books. Worse Case, you can use the purple books for the next hero that IGG produces or sell for Honor Badges.